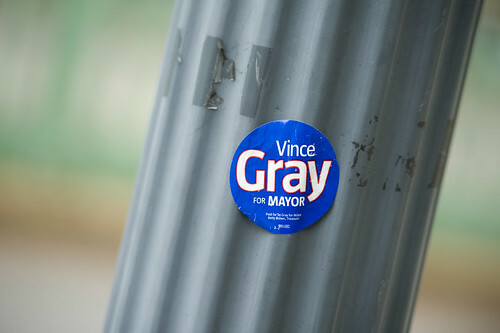 Vince Gray campaign sticker in Logan Circle. Surreptitious. Clandestine. Circuitous. Sweetheart deals. Cronyism. Those are all words that D.C. Mayor Vincent C. Gray (D) used to attack the incumbent mayor on the campaign trail last year. And that’s why he is a disaster right now, not even 100 days in office. The very platform of his campaign – sound ethics, fairness, transparency and dignity – are now crumbling in the face of some ugly allegations. Unlike Fenty, Gray would not make the city pay to heat the swimming pool he and his fellow triathletes trained in; he wouldn’t bring in a bunch of young, tone-deaf, tech-savvy staffers who were better texters than talkers; and he would not go off on fancy foreign vacations (and refuse to answer questions about it). He wouldn’t throw a party for his fraternity or hand its members the kind of sweetheart deals that Fenty defended all the way to the end of his term. Rather than focus exclusively on the big issues that he can make a difference in, such as the deep pockets of unemployment in our city, the epidemic-level HIV/AIDS infection rate, the contentious debate on school reform, his energy is going toward ethics investigations and hearings.